Having some sort of shelter is essential to your comfort when you go out hunting overnight. While you could choose to camp using any old tent, certain products are more effective for hunting trips. This review lays out the best tents on the market, so you sleep soundly under the stars inside the perfect hunting enclosure. Before buying a hunting tent, it is important to consider a few key elements. Making these considerations will help you purchase the perfect option for your needs. How many people do you intend to fit inside? Tents are made in different sizes, and you need one big enough for everyone. A general rule of thumb when it comes to buying tents: it is better to have too much room for a few people than not enough room for everybody. 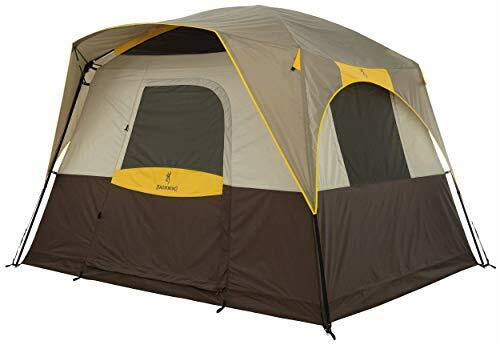 Coleman Sundome 4-Person Tent is very spacious. A tent’s weight is important to consider because it determines portability. If you intend to carry it while backpacking, it must be fairly lightweight. Some are too heavy to be carried in a hunting backpack and must be transported by car. Why does it matter what your tent poles are made out of? Since poles are the scaffolding of your shelter and their durability really does matter. Fiberglass, aluminum, and steel poles are commonly used materials. Aluminum poles are strongest but the most expensive, while fiberglass poles are more affordable and less durable. Steel poles are also strong but are heavy to carry. The most popular tents are designed to endure a variety of weather conditions. The best ones on the market are waterproof, or at least water-resistant. Many have leak-proof floors and sealed seams to ensure your dryness in a storm. Some are made with UV-resistant fabrics to protect you from the sun. A great tent will provide great airflow, no matter how many people are inside. Canvas fabrics are the best for ventilation but even polyester options have mesh windows for breathability. Prevent stuffiness by choosing one with breathable features. Some tents are more complicated to set up than others. Products that are easy to assemble are the most popular. Oftentimes, manufacturers will advertise their efficient setup time. Assembling and deconstructing can be a fun process if it is not too confusing. Now that we've covered that, let's dive into the review and take a closer look at each tent. The Coleman Sundome 4-Person Tent wins the title of “Best Overall” for its remarkable spacious interior and practical nature. Despite its four-person name, it can fit up to six campers inside. The floor is incredibly tough and is made of 1000D polyethylene material. Customers love the leak-proof interior. Its exterior is also waterproof, consisting of durable polyester fabrics. It is one of the best on the market for staying dry in a storm. Rain or shine, the hooded fly provides airflow to prevent stuffiness inside. 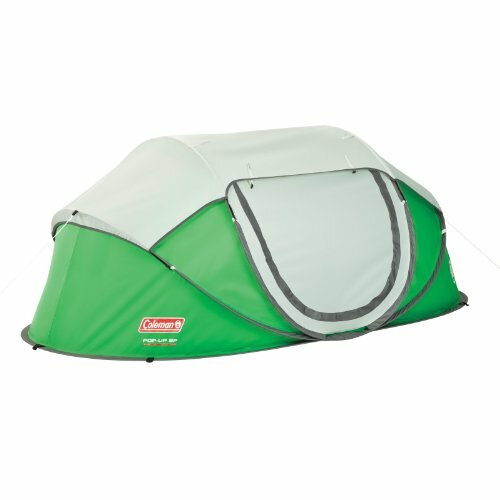 Reviews appreciate that despite the airflow, the Coleman Sundome keeps campers warm enough. It also has an electrical access port to run a cable through the inside and is perfect for using devices like air conditioners. The door is a D-shape with zippers. Coleman is known for featuring quick setup and ease of use. Setting up and deconstructing this item is a simple, straightforward process. This comes complete with a compact carrying bag but does not come with a footprint (tarp). Some users wish the stakes were thicker and sturdier. When it comes to excellent hunting tents, the Coleman Sundome gets first place. Its high-quality design works to keep you comfortable in any weather conditions. It is easy to set up and deconstruct and includes many practical features like an electrical access port and storage bag. You can trust this tough Coleman material to be a reliable shelter for your hunting trip. The Kodiak Canvas Flex-Bow Deluxe Eight-Person Tent is the best canvas hunting option on the market. Canvas makes excellent tent material because it is durable, water-resistant, and conducts refreshing airflow. 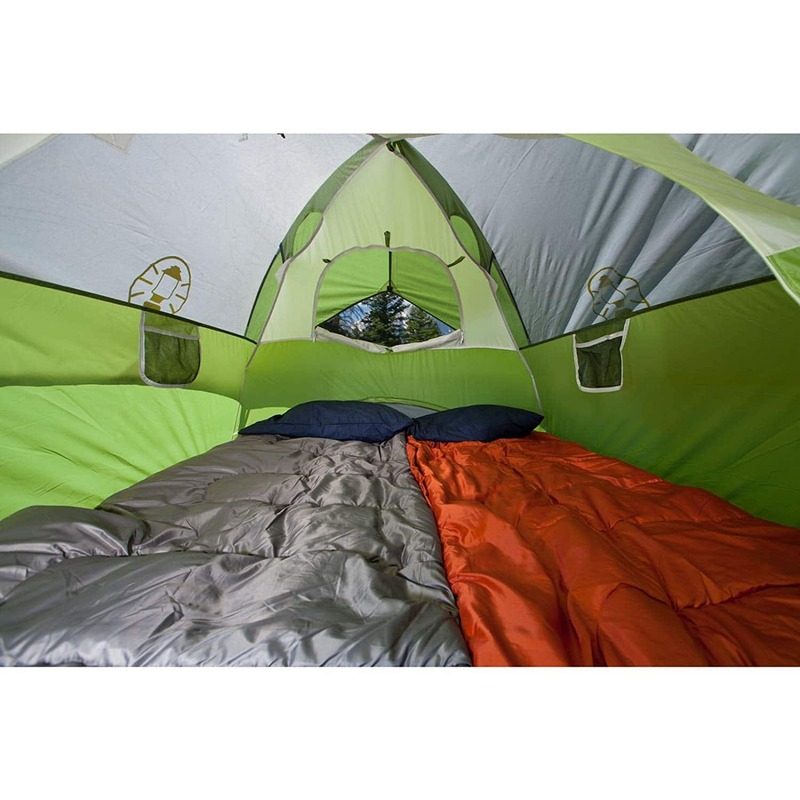 This product is tall, standing at 6’6” and can comfortably fit up to eight campers. Customers love how spacious it is. You can effortlessly enter through either the front or back D-shaped door. Four mesh windows let you see outside while staying protected inside. The floor is made of sturdy vinyl for ultimate leak-proofing. Some users purchased additional floor sealant for extra precaution. The Kodiak can even endure moderate snowfall and reviews remark on the incredible weather versatility. The steel tent poles are designed for strength and stability in windy conditions. This item weighs approximately 80 lbs. In terms of portability, it cannot be transported without a car. As an eight-person option, the Kodiak Canvas Flex-Bow is the best canvas hunting tent on the market. Its spacious interior complements its durable, breathable exterior and this product is adaptable in most climates. Steel tent poles stake it sturdily in the ground. If you have a vehicle to transport it, this Kodiak option makes an excellent canvas shelter. 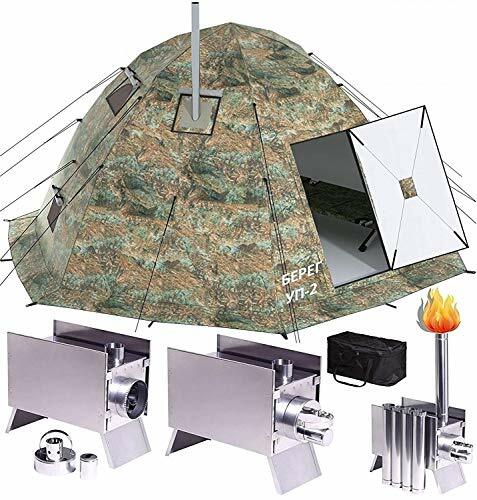 If you are looking for a product that’s fully equipped with a stove pipe, the Russian-Bear Winter Tent is the one for you. This is perfect for up to three people and is especially useful in harsh weather. The popular stove feature is designed with protective screens for your safety. Customers love using this built-in stove for cooking, warming up, and drying wet clothes. The floor is waterproof and the double layer of wall material prevents any condensation. The wall is fireproof for ultimate safety with the stove. You can stay protected from mosquitoes in the summertime with mesh nets covering the doors. This product is quick to set up and easy to take down. Weighing approximately 50 lbs, it would probably need to be transported by vehicle It comes complete with a carrying bag. It is available in camo print so you can blend right into your surroundings. 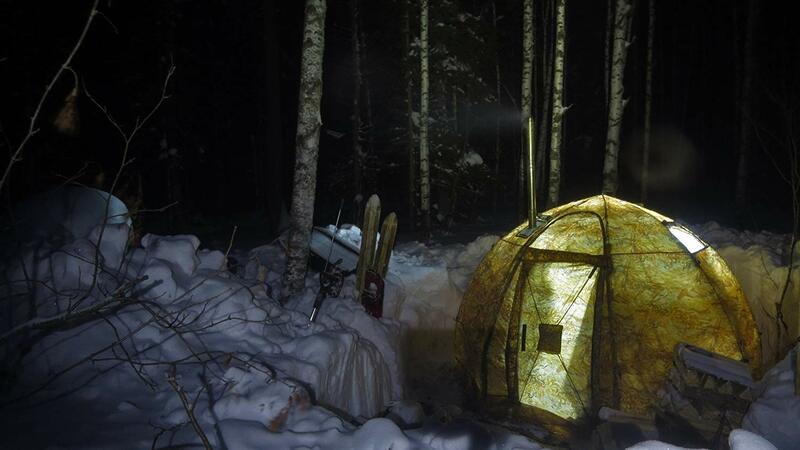 You can be fully prepared for wintertime hunting and camping with the Russian-Bear Winter Tent. The built-in stove provides warmth and is convenient for cooking and drying after a day of hunting in the cold. While it is great for all seasons, it is specifically made for harsh weather resilience. Designed with your safety in mind, it features fireproof walls and waterproof floors. This is by far the best hunting tent with a stove on the market. Many hunters feel that camo is a necessity out in the woods. If you agree, then the Texsport Two-Person Camouflage Trail Tent is the perfect shelter for you. Blend right in outside with this camo, polyurethane item. It can fit up to two people and is incredibly lightweight, weighing only four pounds. The back mesh window has a zippable flap so you can keep the temperature just right. It is not made to endure harsh weather, but that same window also has a zippable storm flap if needed. While the poles are made of aluminum, which is a stronger material, they are fairly skinny and appear cheaply-made. However, customers praise the Texsport for being so easy to assemble. 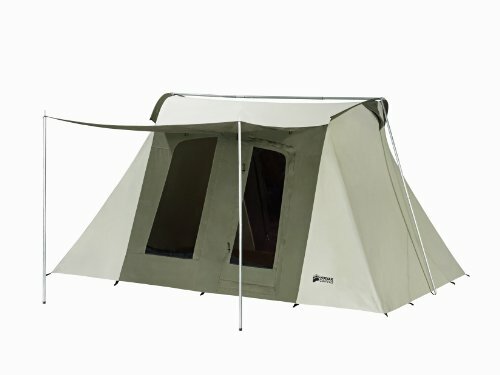 Reviews have referred to it as one of the best hunting tents for the price on the market. It comes complete with a carrying bag. 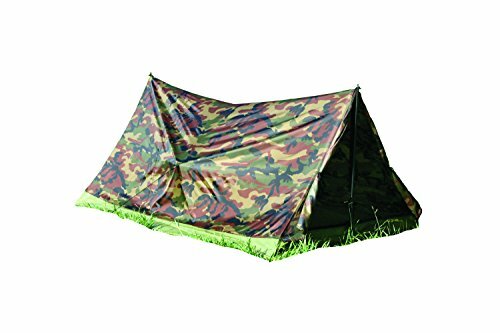 Overall, the Texsport Two-Person Camouflage Trail Tent is a great choice for camo enthusiasts. Hunters can stay discreet outdoors while camping in this lightweight, portable option. It allows you to maintain some temperature control by adjusting the zippable window and making use of the storm flap in a light rainfall. For staying dry in more extreme storms, this is not the best option. However, for moderate weather, this is the best camo model on the market. 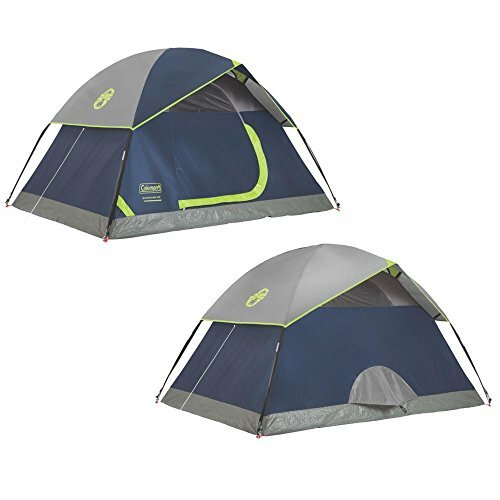 If you are looking for the easiest tent to assemble on the market, look no further than the Coleman Two-Person Pop-Up Tent. In only ten seconds, this can be completely ready for use. Its quick construction is made possible by pre-assembled poles that simply pop into place. These poles are designed to remain sturdy in strong winds. This item is made of polyester fly material to be both waterproof and fire-resistant. The rainfly provides both sheltering and the perfect amount of airflow for ventilation. The floor is leak-proof with tapered seams for ultimate weather resiliency. This product features two pockets inside for storage and easy organization. Weighing only six lbs, this is very lightweight and perfect for carrying in a hunting backpack. It folds flat for practical transportation but customers wish that there were instructions on how to pack it back up. There are a few reports of broken poles in the deconstruction process. The Coleman Two-Person Pop-Up Tent is the best pop up hunting tent. Assembly is nearly effortless and you can stay protected from the weather when camping beneath the polyester walls. Sealed flooring ensures your dryness in any storms and you can stay organized with two internal storage pockets. While the pop-up nature may make it more fragile during deconstruction, its overall convenience of use is remarkable. The Naturehike Cloud-Up 1, 2, and 3 Person Tent is an excellent choice for hunters needing to camp in any season. This product comes with two layers for the ultimate four season shelter. 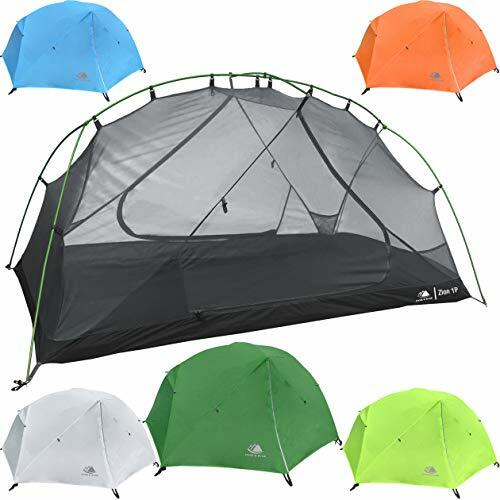 Be prepared for camping in fall, winter, spring, and summer with its remarkable nylon construction. Anti-scratch nylon is durable and provides great air flow. The silicone-coated rainfly is guaranteed to be both waterproof and has UV 50+ sun protection. The second, weather-resilient layer is removable for warmer months. This item is easy to assemble and can be done in only two minutes. Thorough instructions are included to provide the most user-friendly experience possible. It is available as a one, two or three person-sized shelter. At its largest size, it weighs under six lbs. Customers love how portable and lightweight this is because it fits right into a hunting pack. Lightweight aluminum poles are designed to remain sturdy through rainfall, winds, and even snowfall. It comes complete with a carrying bag and a footprint, so you don’t have to bring your own tarp. If you’re looking for a seasonally versatile option, the Naturehike Cloud-Up is the best one for you. Camp comfortably in fall, winter, spring, or summer inside the double-layered nylon. Durable and adaptable qualities make it perfect for any weather. As a lightweight offering, the Naturehike is simple to set up and take down. It also comes fully equipped with a footprint and compression bag for your ultimate convenience. If you love to hunt in the wintertime, chances are you may be spending a night or two in the cold outdoors. 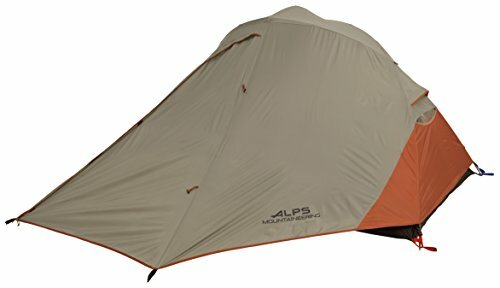 The ALPS Mountaineering Extreme Two Person Tent makes winter camping warm and cozy. Its polyester taffeta material is both water-resistant and UV-resistant, and features sealed seams for ultimate weather durability. Customers love how straightforward setup is. Three aluminum poles make this a free-standing tent with little to no assembly hassle. Weighing seven pounds,it is lightweight and convenient for carrying in a hunting pack. There are two doors for ease of entry and multiple mesh windows for great air flow. Mesh storage pockets inside to help you stay organized. It also has vestibules for additional storage space. The ALPS Mountaineering Extreme Two Person Tent is great for your wintertime hunting trips. Sleep warm and cozy inside this polyester taffeta shelter, and have plenty of room for your gear in the spacious vestibules. The breathable mesh windows are protected by the rainfly so you can stay dry and comfortable in the cold. Being lightweight and easy to assemble, this is the perfect portable winter option. If you love hunting and camping solo, the Hyke & Byke Zion 1 and 2 Person Backpacking Tent is the best fit for you. While this product can technically fit up to two people, two is a tight squeeze. For a solo camper, it provides the perfect amount of space. Constructed with non-stretch polyester material, this product is lightweight but strong. Users love how the rainfly and rip-stop add to its toughness. Bathtub material makes the floor waterproof and great in wet weather conditions. Taped seams ensure dryness. Many customers have successfully used this product in the winter seasons. A single pole makes this product incredibly easy to set up and deconstruct. Weighing under four pounds, it is the ideal size for your hunting pack. It conveniently comes with a footprint included. It is available in many colors like blue, green, orange, grey, and white. For the solo hunter, using the Hyke & Byke Zion Backpacking Tent is a great choice. Camping with this product gives you and your gear plenty of room. It is lightweight and easy to carry, but durable in harsh weather. You can stay dry and comfortable inside the tough Hyke & Byke. Instead of feeling lonely out in the woods, you may feel glad you get this great little space all to yourself. Sometimes, tents sacrifice quality to be lightweight. This is not the case with the Featherstone Two Person Tent. This item is both lightweight and incredibly strong. Designed for the backpacking hunter and weighing only five pounds, the Featherstone is the best ultralight hunting tent. The material is tear-resistant for ultimate durability. Users love the breathable feel of its micro-mesh. Two doors offer both a front or a back entrance and vestibules create optimal organization for your gear. It is waterproof with thoroughly taped seams and bathtub flooring. This weather versatility makes it great in all moderate seasons. A waterproof rainfly and footprint are included for your convenience. One aluminum pole impressively holds the whole thing together. Customers appreciate this for its ease of use. This free-standing structure is easy to assemble and take apart. 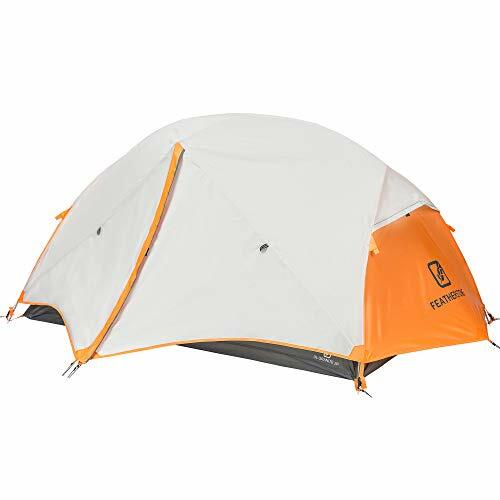 If you are looking for a lightweight option, the Featherstone Two Person Tent is an excellent, ultralight choice. This product is perfectly portable in any hunting pack and stands sturdy in any moderate weather conditions. Stay protected from the rain with taped seams. You can also rely on staying dry with durable floors and a footprint. With only one pole, you can assemble this product quickly and easily pack it away again. This is the perfect option for spending lots of time on the move as you won’t even know you are carrying it. The Browning Camping Big Horn Family Hunting Tent is our “Editor’s Pick” because it’s well-loved by customers and great for families. This is extra tall so there is plenty of space to fit multiple people, sleeping bags, and hunting gear. Easily assembly in just about five minutes. With a free-standing design, Browning’s fiberglass poles are strong and can endure almost any weather conditions. Even when full of people, users can count on this tent for reliable airflow. Four mesh windows keep it ventilated and breathable. Sealed floor seams are designed to keep you dry and the polyester fly also offers rain protection. Internal mesh storage pockets provide practical organization for your gear. Weighing 21 lbs, this is not the lightest for carrying and is most easily transported by some type of vehicle. Some customers wish the nylon floor was made out of tougher material. However, the overall quality is in no way compromised by this feature. Simply bring your own footprint for additional durability. If you’re looking for a high-quality, family-friendly option, the Browning Camping Big Horn Family Hunting tent is an excellent choice. With quick set up and a spacious interior, this is perfect for kids and groups of people. Stuffiness is no issue with so many windows for ventilation. Stay comfortable and dry, even in stormy weather. Your family will love camping in the Browning. While many hunting tents are made of polyester, canvas is another popular material. Canvas is known for being sturdy, durable, and breathable. It is also a waterproof fabric and great in wet weather. If you are looking for ultimate ease of use, a pop-up tent may be right for you. Pop-up options are nearly effortless to assemble because there really isn’t any assembly. Pre-assembled poles do all the work for you, simple jumping into place. Some tents are designed to endure all four seasons, while others are best suited for either cold or hot months. If a product is made to keep you cool, it is best for summer months. Those made for warmth are best in colder temperatures. Ultralight tents are the best option for hunters who transport all their gear by backpack. These won’t weigh you down as you carry the rest of your hunting gear. At the end of a long hunting day, falling asleep inside an excellent tent can be an amazing feeling. When choosing the perfect option for your needs, remember to consider space, weight, and pole material. The most popular hunting tents are durable in any weather conditions, breathable, and are easy to set up. We hope this review has helped you identify a great hunting tent for your camping adventures. Chances are, you may have additional questions about your hunting tent in terms of washing, waterproofing, and staying warm. This Q&A intends to answer a few potential uncertainties so you can have ultimate success on your hunting and camping trips. Do NOT wash a tent in the washing machine. This can cause damage and shrink it. To successfully clean your tent, bring it to the bathtub. You’ll need water, soap, and tent cleaner (if you have access to some). Clean any specific dirty spots before emerging the whole item in the tub with soap and warm water. It should be unzipped and turned inside out. If you are using a tent cleaner, there may be instructions on the bottle that say how long to soak it. Otherwise, play it safe and soak it for a few hours. Next, drain and refill your tub with fresh water as the dirt from your tent washes away. You may have to do this more than once. When it appears to be clean, you can hang it to dry. Do NOT use a drying machine. 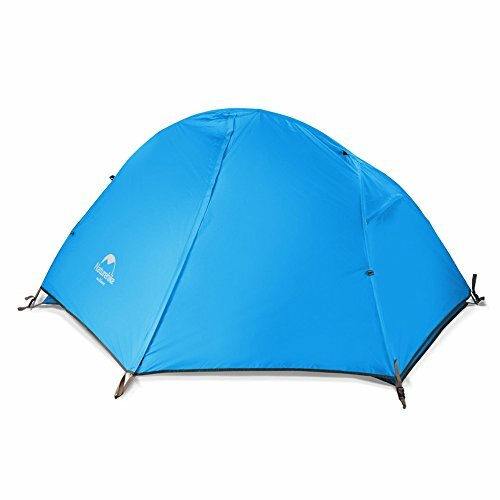 How Often Do I Need to Clean My Tent? Taking good care of your tent will spare it from unnecessary damage and ensure its longevity. It is important to clean your item after any long camping trip. Sometimes, you can use it for a few shorter camping trips before needing to clean it. The frequency of cleaning depends on how much exposure your tent has had to dirt, tree sap, bird droppings, etc. Use your best judgment, if your tent looks dirty, clean it when you get home. Even if you buy a waterproof tent, the waterproof coating may fade over time. Other tents are not designed to be waterproof in the first place. Waterproofing your tent yourself is a great way to stay dry and comfortable outdoors. To fix leaky seams, you will need seam sealer. Apply it to the problem spots and let it sit for 24 hours. To waterproof the fabric, you will need polyurethane sealant. Paint it over the fabric after picking off any peeling areas. Let it dry for 24 hours. Staying warm is essential to a good night’s sleep. Make sure to bring enough layers for when the temperature cools off at night. Bring a sleeping bag that is designed for the climate of your location. If you are camping in the winter, invest in a sleeping bag liner. You can also insulate your tent with special carpet/rugs designed for camping.